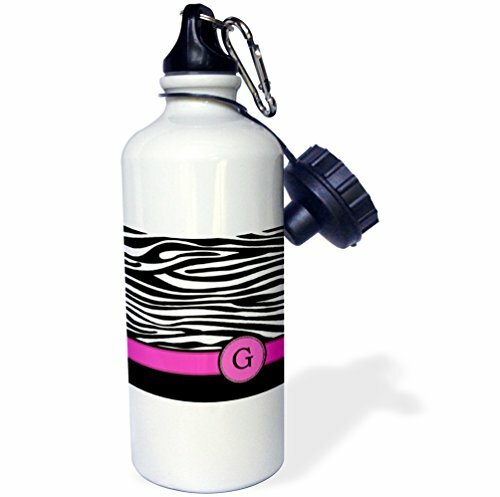 Letter G monogrammed black and white zebra stripes animal print with hot pink personalized initial Water Bottle is is an eco-friendly way to carry your favorite drink to school, work or anywhere you go. This 20 oz stainless steel sports bottle features 2 caps, 1 easy-flow twist on drinking spout and 1 standard twist on cap. Another great feature is the included carabiner clip that allows you to attach your bottle securely. Custom printed high gloss image sublimated directly to white glossy exterior surface. Image on both sides. Color will not run or fade with use. Hand washing recommended.